Clustering provides a single point of administration for other access points. When a change is made on the Master Access Point, it is pushed out to the other access points in the cluster. This feature reduces the costs and complexity of managing multiple wireless access points. The latest firmware, version 1.1.00.003 or higher, for the Linksys LAPAC1200 and Linksys LAPAC1750 has a cluster feature. You may need to manually upgrade the firmware in order for this feature to work. A Cloud access point like the Linksys LAPAC1200C cannot be clustered with a Non-Cloud access point such as the Linksys LAPAC1200 and vice versa. 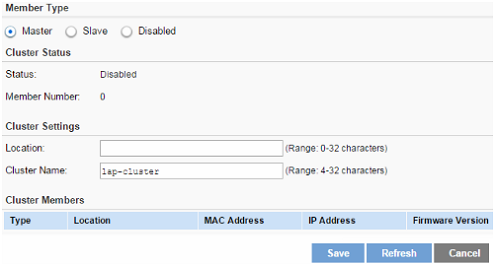 The Cluster Settings page allows you to manage the access point cluster function. The access point cluster function provides a centralized method to administer and control wireless services across multiple devices. After access points are clustered, you can view, deploy, configure, and secure the wireless network as a single entity. In each cluster, one access point must be manually configured as a Master. It's not allowed to specify two or more Masters in the same cluster. A cluster must be the same model. For instance, if the Master is a Linksys LAPAC1750, then the entire cluster should only include Linksys LAPAC1750. The access points are connected on the same bridged segment. Cluster name must be the same on all the access points joining a cluster. Cluster mode is enabled on both access points. Cluster is not supported in Wireless Distribution System (WDS) mode or Workgroup bridge mode. When cluster is enabled, WDS and Workgroup bridge will be disabled automatically. Access point cluster can only be created in the same subnet of a network and a cluster can support 16 access points and must be the same model number. Each access point within a cluster must have the same management VLAN configured. Only one Master in a cluster network. When you do a firmware upgrade on the Master in a cluster, the firmware of the Slaves within that same cluster will also be upgraded. Disabled – Disable the cluster function. Master – Enable the cluster function and assign the access point to be the Master. NOTE: There should be only one Master per cluster. If another Master is detected, the new access point that wants to become Master will be automatically assigned as a Slave. Slave – Enable the cluster function and assign the access point to be the Slave. Backup Master – When an access point works as a cluster Slave, it can be enabled as a backup Master. When the Master goes offline, it will take the role of a Master. When the backup Master begins to work, it will send advertisements and Slaves will send keep-alive and report sessions to it. When shareable settings are modified in it, it will share them to all Slaves. When the Master gets online again, this backup Master Access Point will stop the Master function and let original Master Access Point take over. Disabled – Cluster function is disabled. Active – Cluster function is enabled and active. Active (Backup Master) – Cluster function is enabled and backup Master is active. Inactive (Cannot reach the Master) – Cluster function is enabled but inactive because it cannot reach the Master. • Member Number – Number of members which are active. If an access point joins the cluster but is powered OFF or cannot reach the Master, it isn't counted. • Location – Description of where the access point is physically located, for example, Reception Length is from 0 to 32 bytes. This is optional. • Cluster Name – Name of the cluster for the LAPAC device to join (for example: lab_cluster). All access points which have the same cluster name belong to the same cluster. Length of this value is from 4 to 32 bytes and special characters, except the colon (:), are allowed. This is a mandatory field. • MAC Address – MAC address of the member. • IP Address – IP address of the member. You can click the link to enter the member's web user interface. • Firmware Version - Current firmware version of the member. The Client Sessions page displays the status of wireless clients within the cluster. The session is the period of time in which a user on a client device (station) with a unique MAC address maintains a connection with the wireless network. The session begins when the WLAN client logs on to the network, and the session ends when the WLAN client either logs off intentionally or loses the connection for some other reason. NOTE: When one wireless client of Captive Portal roams from one access point to another in the same cluster, it does not need authentication again. • IP Address – IP address of the access point to which the client connects. • Location – Location of the access point to which the client connects. • SSID – Wireless network name of the access point to which the client connects. • User MAC – MAC address of the client. • Online Time – Displays how long this client has been online since it is authenticated. Unit is in seconds. • Link Rate – Indicates the link rate of the client. Unit is in Mbps. • Signal – The signal strength of the client is displayed. Unit is in dBm. • Rx Total – The total bytes which are received from the client by the access point. Unit is in Bytes. • Tx Total – The total bytes which are sent to the client by the access point. Unit is in Bytes. • Rx Rate – Current transfer rate of the data which are received from the client by the access point. Unit is in Kbps. • Tx Rate – Current transfer rate of the data which are sent to the client by the access point. Unit is in Kbps. The Channel Management page is where you can manage the channel assignments for access points within a cluster. 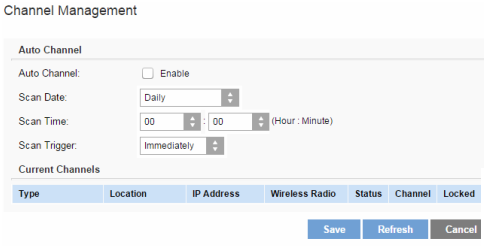 When channel management is enabled, the access point automatically assigns radio channels within a cluster. Auto channel assignment reduces mutual interference (or interference with other access points outside of its cluster) and maximizes Wi-Fi bandwidth to help maintain efficient communication over the wireless network. • Auto Channel – Access point scans available Wi-Fi channels and changes the channel if better network performance is possible. This is disabled by default. • Scan Date – It specifies in which days Auto Channel function does the channel reselection. Options include: Daily, Every Monday, Every Tuesday, Every Wednesday, Every Thursday, Every Friday, Every Saturday or Every Sunday. • Scan Time – It specifies at what time in defined days the Auto Channel function does the channel reselection. Immediately – Do the channel reselection right now. No Clients – Do the channel reselection only if no clients are connected to the wireless radio. If clients are connected to the wireless radio, then this scan will be ignored. • ​Type – Member type of the access point. It can be Master, Slave or Backup Master. • Location – Location of the member. • IP Address – IP address of the member. • Wireless Radio – Number of wireless radio in the member. One stands for 2.4 GHz radio, and two stands for 5 GHz radio. • Status – Status of the wireless radio. It can be Active or Inactive. • Channel – Current channel number of the wireless radio. • Locked – It displays if the channel of the wireless radio is locked. If it's locked, then the wireless radio always uses the channel.